Advertisers love to include “beautiful” people in their ads, thinking I guess, people will think their product is like the “beautiful” person. If you are like me and find that you have fallen for this, buying a car somehow thinking now I can be beautiful, you realize the folly of such thinking. Watching “A Boy and His Dog” helps me realize that I have a lot to learn on what is beautiful. Hope you enjoy it as much as I did. Sam Berms shares his four plus one habits that he believed will make a happy life. Sam lost his life this past Friday and was remembered by his family and friends at Temple Israel in Sharon, Massachusetts. Sam was only 17, a Junior at Foxboro High School in Foxboro, Massachusetts, but I believe he knew more about life than many of us senior citizens. Hope you enjoy and share his five secrets. Post traumatic stress power—games can help us deal with traumatic stress! Can that possibly be true? In this 20 minute video, Jane McGonigal shows us how we can garner strength and a new zest for life through trauma. Of course she is not suggesting that we go out and create some traumatic stress to achieve this, but she is suggesting what Passionists have for the past three hundred plus years been telling us, i.e. trauma is part of our lives—it’s not meant to “do us in”, but to make us stronger, to help us choose life! After watching this, I made my 2014 New Year’s resolution. Actually, realizing I rarely followed through for any length of time with such resolutions I quit doing this years ago but I’m going to try again, I’m making a resolution—I’m going to play more games. Author CPPPosted on January 2, 2014 January 1, 2014 Categories St. Paul of the Cross, SufferingTags Jane McGonigal, Mental health, Passionists, Post-traumatic StressLeave a comment on Choose Life! Stop the pain! Overwhelming feelings of despair may cause anyone to think that things would be better if they had never been born. Looking for relief from emotional or physical problems, we look for the right drug or some sort of avenue of escape. Rich or poor, all of us must endure distress in life. Of what heavenly good is pain? The classic movie “It’s a wonderful life” starring Jimmy Stewart and Donna Reed paints a dramatic picture of a desperate situation on a great guy named George Bailey. He looses sight of his overall importance in life when faced with financial ruin and accusations of fraud. He tries to self-medicate the pain with alcohol and drives himself to a drawbridge where he ponders suicide on a snowy Christmas Eve. A peculiar angel named Clarence intervenes at the last moment by appealing to the goodness within the man that underlies all else. Clarence throws himself into the torrent and yells for help to the man. Instantly, saving the life of another is the automatic response and the thoughts of his plight disappear. The angel allows George to see how things would be if he had never lived at all. The value of his life is seen clearly in the positive events that shaped his past and present. George Bailey sees the light and is, in a sense, born again. Pain is an inevitable part of life and serves a possible purpose. As gold is refined by fire, we tend to value the best things in life when enduring pain. Simple pleasures taken for granted are prized when they are lost. A breath easily taken, the sight of a loved one or walking with a spring in one’s step may be too much for some to expect. The need for a miracle brought crowds to Jesus as he taught and healed. The suffering sought forgiveness of sins, demons driven out, lepers cured and on and on. Many were drawn to him seeking relief from pain. God allows pain to serve as a call and as a means to convey the greatest love story of all. The passion of Jesus Christ is the infinite mystery of the revelation of God. Oh! How inspired and elevated our minds become when experiencing an awesome natural beauty such as a magnificent flower or a scene of sun and clouds, mountains or water. It is easy to believe in the God that sends new life, most impressively when it is our own child. God is capable of doing anything to perfection. Why would mental and physical pain and spiritual anguish be the method chosen to redeem all of mankind and reunite a sinful people to a holy God? An act of unconditional love is a perfect offering as there are no preconditions as well as no payment. It simply must be received. The relevance of the act is balanced against the ability of the giver. All powerful, all loving, and beyond imagination, God acted by giving the highest of sacrifices as love that knows no bounds submitted to pain of every sort as a holy, living sacrifice. God’s open invitation to enjoy His friendship and forgiveness is the good news for all to be welcomed into a wonderful life. Author CPPPosted on November 21, 2013 November 20, 2013 Categories Meditation, SufferingLeave a comment on Who is Your Hero? St. Paul of the cross is often pictured cradling the crucifix almost as one would show an infant. In more than one depiction he is seen as rising up to Jesus on the cross with Jesus reaching down to welcome him up to share in His passion. At first glance, this idea of passing along suffering seems macabre, irrational and repulsive. Would Jesus really want any person to endure any part of His sufferings? Empathy is one of the most desirable and respected human emotions. Responding to others in their time of need makes us not just an animal high up on the food chain, rather a form of life that acts with kindness and understanding. Taking this attitude to a higher level has been the motivation behind many selfless lives given without regard for personal gain or recognition. Sometimes the heart must be served first and foremost. Compassion is connection. When someone we love is sick or hurting emotionally, our heart goes out to them. This “pulling at the heartstrings” can be powerful or faint depending upon how it is nurtured. 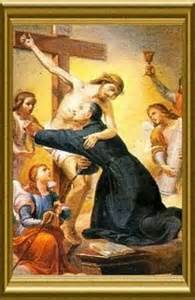 When St. Paul of the Cross went on his forty day retreat, he immersed his whole being into the gift of Gods’ love through the passion, so much so that sharing in it would be pure ecstasy beyond any other pleasure possible. Jesus surrendered to the Father’s will in the most important act of sacrifice ever. Embracing the sufferings of Jesus Christ is to accept all that He offers just as we would welcome a newborn child. Salvador Dali, a famous artist of the twentieth century, was generally known as an eccentric, surrealistic painter. His work was filled with strange and unexpected images not understood at first glance, however few would argue they were not thought provoking. The work was meant to convey a message that the observer could find for himself or herself out of a sometimes-bizarre scene laced with symbolism. One painting seems to make a departure from Dali’s typical style. He was originally inspired to paint this subject after seeing a sketch done by St. John of the Cross. The powerful image of Christ crucified is unusual in two ways but the message is overwhelming. The view of the crucifixion, floating over a seascape, is from above, as if from God’s eyes and Dali was a master of perspective. This painting is a very large, dramatic scene with Christ attached to the cross without nails. Intentionally, the whole body is a well-toned muscular man without any wounds, a perfect corpse. It is said the artist had a dream in which he was told to paint the beauty of Jesus. The point of view and the bloodless body are very different and that is exactly what makes us think. Why? It is always hard to convince young people how short life really is, but the older we get, any resistance fades into agreement. Our time on Earth may be short but who can honestly say that they have no regrets? David of the Old Testament was a man who loved God above all. A writer of psalms and king of Israel, he had failings and regrets. Peter, trusted friend of Jesus, failed to acknowledge the Lord when he feared for his life. As much as we strive to be perfect and try to control things, we are subject to the unexpected and the weakness of our nature. We are as different as the stars in the sky, however a need for union with God and each other is a common attraction. The way to keep this source of life viable is to partake of God’s gift of flesh and blood, bread and water, light and truth. As the fishermen below in the Dali painting, we must encounter God and the reality of creation by living life in light of the pure, chosen sacrifice the Son of God. Oh! how easy it is to imagine God somewhere far away, in another dimension, another reality. Some religions teach how we should work our way closer to a divine consciousness by withdrawing from the world through meditation and self- purification. Jesus breaks down the barriers. He enables and empowers you and me to contact God here and now, just as we are. His words to us are inviting, welcoming and forgiving as He seeks our company. The notion of God is an abstract idea to some, so the Word became flesh and has dwelt among us. His strongest message is eternal, universal and personal. I love you. The Passion and death of Jesus Christ is a plan of salvation that defies our reasoning, yet it is simple enough for a child. The question “Why did Jesus have to die on the cross?” has been asked many times and a child expects a simple answer. A good reply might be “to save us from our sins” with the understanding that the answer is accepted in childlike faith. As adults more complete reasoning is desired. The acceptance of the emotional, mental and physical devastation suffered by the Lamb of God is meant to be an act of magnificence that surpasses all understanding. God loves. The crucified Christ is the proof long ago, here and now and always for all who will accept the gift beyond comprehension.